Oct 20, 2006 in "Epcot International Flower and Garden Festival"
LAKE BUENA VISTA, Fla. -- A flower-festooned pirate ship will drop anchor and Disney princess topiaries will color the landscape at the 14th annual Epcot International Flower & Garden Festival April 5-June 3 at Walt Disney World Resort. Previously running for seven weeks, the popular festival expands to 60 days this year and offers more floral fantasy and gardening fun than ever before. 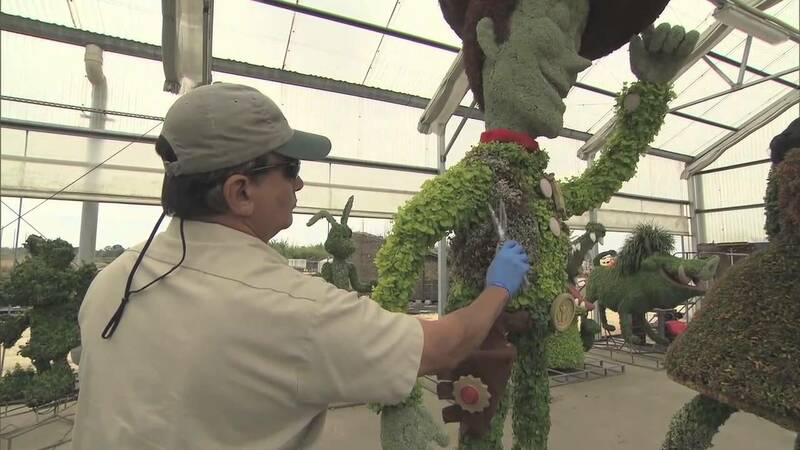 The first-ever pirate ship topiary will feature Peter Pan and his nemesis, Captain Hook, plus Tinker Bell -- all as intricately designed topiaries. Pirate Mickey Mouse and Princess Minnie Mouse, plus Cinderella and Prince Charming, Belle and her Beast from "Beauty and the Beast," and other popular characters make topiary appearances throughout the park. A towering Pirate Goofy, with Donald Duck and Pluto, offer Disney gardeners a chance to reach new topiary heights. In all, there will be more than 70 topiaries -- plus 30 million blooms, artfully designed floral beds, expertly crafted bonsai trees and lush rose gardens gracing the 300 acres of Future World and World Showcase. For the first time in the festival's history, Disney's horticultural team will plant two crop rotations during the fest -- which will produce "the biggest opening show ever" and allow for a more brilliant floral display for the festival's duration, says horticultural manager, Eric Darden. Beyond the dazzling displays of bursting blooms, the Epcot International Flower & Garden Festival is known by gardening aficionados for its celebrity guest speakers, hands-on seminars and innovative planting demonstrations and exhibits. Each evening, Flower Power concerts rock the park with live entertainment from top acts of the 1960s and '70s. Past lineups have included The Turtles, Davy Jones, The Association and other crowd pleasers. Minnie's Magnificent Butterfly Garden is back with hundreds of butterflies in a screened, walk-through enclosure that will include a live exhibit showing how caterpillars form a chrysalis and emerge as butterflies. The family-oriented Growing Future Gardeners area, complete with colorful (and tasty) planting ideas for kids and parents, doubles in size this year following an overwhelming family response during its 2006 debut. New themed weekend events will salute spring romance and Easter whimsy. Back by popular demand are the child-friendly I Dig Bugs weekend, Art in the Garden weekend, and the time-honored Mother's Day celebration, among others. The Festival Center, where guests can find program guides and festival merchandise and attend speaker presentations and demonstrations. The popular Great American Gardeners series, opening with Paul James of HGTV's "Gardening by the Yard," April 5-8. A "Lift and Sniff" Fragrance Garden at the France pavilion showcasing flowers and plants used to create several Guerlain perfumes. Disney Gardening at Home presentations during which Disney horticulturists share tips and secrets for at-home gardening. Kids' activities, including an upgraded, fun-filled Tinker Bell's Fairy Garden, Disney character meet and greets and daily ladybug releases. More information about the Epcot International Flower & Garden Festival is available by calling 407/W-DISNEY (934-7639) or by visiting disneyworld.com/flower. The festival, including all gardening programs and exhibits, is included in regular Epcot admission. And while millions of blooms adorn Epcot, one million very special dreams will be granted to guests visiting Walt Disney World and Disneyland resorts during a first-of-its kind celebration, "The Year of a Million Dreams." Guests will find Disney cast members delivering an unprecedented level of guest service. The celebration will also be highlighted by the debut of innovative Disney attractions and entertainment spectaculars at both Disneyland and Walt Disney World resorts.